How Much Are Students Willing to Pay for an “A” in a Course? How much money would a student pay to get an “A” in an introductory college course? I ran an experiment in my introductory undergraduate class yesterday that showed the average student was willing to pay $525. I frequently give lectures on Supply and Demand, which is a key foundation of economics. 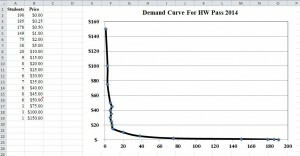 Demand curves, which show how much is bought at every price, are often an abstract concept for many students. To make the demand curves less abstract I explain to students that running a simple English auction, where the price starts low and goes higher over time, produces a demand curve for any good or service. I then proceed to run an auction to actually create a demand curve. 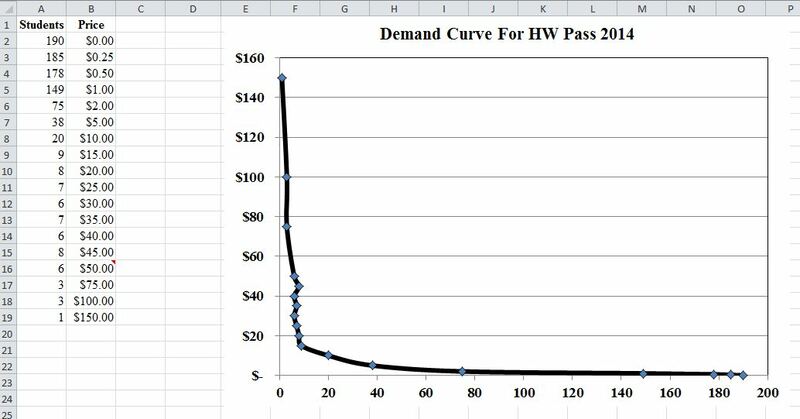 During the auction I plot every bid using Excel and a demand curve grows on the screen round by round. I tell the students up front that all proceeds from the auction benefit a local homeless shelter, provide them with the homeless shelter’s website and show them the donation acknowledgment letter a few classes later. Yesterday, I auctioned off one “free homework” pass. The pass enabled the purchaser to skip a single homework assignment and automatically get an “A” on that assignment. Each homework is a 5 question online quiz. The online quiz can take at most 15 minutes, but the typical student does the quiz in 4 minutes. There are about 30 homework assignments in the course and homework counts for 10% of a student’s final grade. The auction was very exciting this year. When the economy is in poor shape few students are willing to pay much. However, when the economy improves students tend to bid quite high. The winning bid this year was $150, which is quite an increase from the $40 high bid during the depths of the recent recession. The winning bid is not useful for calculating how much students are willing to pay for an “A” since many of the winners have been quite up-front about why they bid so much money. They have stated they bid high because the money was going to charity. However, after talking to many students, almost all the low bidders are not thinking about helping out homeless people, but instead are interested in getting a “free” A. One hundred and ninety students participated in yesterday’s auction. The price where half (95 students) were willing to buy the homework pass was about $1.75. The homework pass comprised 0.333% of their total grade. If they were willing to pay $1.75 for 0.333% of their grade then it is possible to calculate the price they would pay for 100% of their grade. The calculation for 100% is $1.75/0.333% = $525. It is also possible from the auction to calculate the value students put on their time. On average students take 4 minutes to do the quiz. My guess is that it takes about 1 minute to log on, navigate to the quiz, read the instructions and check the final score, so buying the homework pass saves the average student about 5 minutes of time. Since they were willing to pay $1.75 to gain 5 minutes this means they are valuing their time around $21 per hour. The $21 is a slight over-estimate since students are guaranteed an A with the pass, and are not guaranteed an A when doing the quiz. Can you price yourself out of a job? We were in New York City recently and my wife wanted to treat the family to something memorable so we went to a Broadway play. We saw “Matilda,” which is a musical based on a children’s story by Roald Dahl. The story is about a small girl who goes to a school run by an evil woman. The girl discovers she has magic powers and uses the powers to set everything right. While the plot did not hold my attention, the set design and scenery did. The set was amazing. Beyond the wonderful design was how items came in and out. I was expecting a small team of crew members to be shuttling desks and other furniture onto the stage like most plays. Instead, the entire set appeared to be mechanized. Desks and chairs rose up from the floor. Blackboards swung down from the ceiling. Humans were eliminated from the process of scene changes. As I sat there marveling at the automation I wondered why the producers so carefully eliminated the crew from the show. It turns out Broadway crew members are part of a very powerful union called local 1 of the IATSE (International Alliance of Theatrical Stage Employees). The Wall Street Journal had an interesting article that suggests the union has negotiated very well and that top crew members earn $300,000 to $400,000 per year. Given these costs some simple calculations show it makes financial sense to eliminate the crew. Let’s say it takes five people to shift scenery in the play at $250,000 per year and that it costs $1 million to automate the process so that these people are not needed. If the producers think that the play will run for more than one year then it makes financial sense to eliminate the stage crew and create an automated set. In the first year the producers can save a 1/4 million dollars by automating. The union, by asking for very high wages, can indeed price their own people out of a job. If Matilda goes on the road to other cities beside New York, my guess is that the scenery and set will be much less automated. I predict this because road shows tend to stay in cities for much shorter times than plays run on Broadway. Moreover, Forbes magazine points out that IATSE members outside of local 1 in New York City earn far less. Have you encountered other situations where people have priced themselves out of work? Advice to High School Students: Why Should You Go To College? I teach a large Introduction to Macroeconomics class every Spring. For a number of years one of the local charter high schools has sent a group of their seniors to my class to give them a taste of college. A few days ago I went to the charter high school to meet the 13 students who will be taking my class. One of the things I talked to them about was why it is important to go and finish college. As an economist I laid out a pretty simple argument. If you get a 4 year college degree you earn a lot more money. I used the Bureau of Labor Statistics quarterly “Usual weekly earnings of wage and salary workers” news release as the basis for my argument. The numbers I used came from table 5 of the Nov 1, 2013 release, but the answers haven’t changed much from year to year. I divided the class up into men and women and had each gender look at the table and do their own calculations. The table shows the median weekly earnings for people with just a high school degree were $742 a week for men and $569 a week for women. The median weekly earnings for people with just a bachelor’s degree and no higher education were $1,267 for men and $941 a week for women. While there are many more complex and correct ways to calculate lifetime wages (see my Business Macroeconomics textbook’s Chapter 14 section 3) I had them do a simple calculation. First they multiplied the weekly figures by 52 to turn the numbers into yearly averages. Then they multiplied the result by 40 since the average person spends about 40 years in the labor force. We finally rounded the results and got the following table. There were two reactions to the table. The first was anger by a lot of women about the large difference in lifetime pay. The second was the recognition that even if college is expensive it clearly seems worth it to go and graduate. I don’t know if the promise of more gold at the end of the rainbow will help some of them complete college but it is eye-opening how large the pay gap is currently between high school graduates and college graduates. Why Do Many Great Bands Disappear Before Their Fans Tire Of Them? How many of the bands you like have disappeared? I was at breakfast this morning and a U2 song started playing over the speakers. The song reminded me that I was once a big U2 fan, but I have not heard much from the band lately. The official U2 website confirmed what I had been thinking. They did a single for the new Nelson Mandela movie “Long Walk to Freedom” but other than this song, their official timeline (http://www.u2.com/timeline) stops in 2011. It can’t be that they are too old. Bono was born in 1960, making him in his early 50s, which is years away from when most people retire. Thinking about the disappearance made me realize that not just U2, but lots of bands hit the charts and then disappear long before their fans tire of their music. Why do so many great bands disappear before their fans tire of them? I believe the economic idea called “backward bending labor supply curves” explains the situation perfectly. Normally, most people believe that the more someone is paid the more they want to work. For example, if I offer you $10 per hour to mop floors, flip burgers or greet guests you will tell me how many hours you want to work. However, if I double the pay to $20 per hour, under normal circumstances, most people will want to work more hours and some people will work the same amount, but no one will say they want to work less. 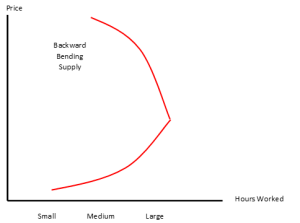 The idea of a backward bending supply curve (see the picture below) says that people want to work more as pay rises up to a point. Once that point is reached, people have enough money and don’t need or want any more. From this point on increases in pay reduce the amount of work because it takes less time to earn the target amount. Let’s assume you are a struggling rock star. Your fantasy goal is to earn $2 million dollars this year. Let’s assume you are currently doing 100 shows a year and earning $1,000 a show. You are well below your $2 million goal so if someone offers you $2,000 a show to do an extra 10 shows, you will jump at the chance. Now, let’s assume you become popular and the promoter starts paying you $100,000 per show. If you do 100 shows you will be earning $10 million a year, which is far above your target amount. Instead, of doing 100 shows, you will likely cut back and do far fewer than 100. In the first case, the increase in pay from $1,000 to $2,000 a show causes the musician to work harder, but, in the second case the increase in pay from $1,000 to $100,000 results in the musician working less because they can earn their target amount with fewer shows. Superstars can earn a lot of money from a single tour. This makes them prime candidates for cutting back their work so much they simply drop out of sight well before fans want them to retire. Since professors get relatively low pay and few raises, I have not personally had the opportunity to see if I have a backward bending labor supply curve. What about you? If your pay was boosted a huge amount would you cut back working or work more?